​The art of shaving is no joking matter. There are hundreds of shaving creams on the market, and choosing from a wide array of products is difficult when they all pertain to the same thing. While the list of reputable shaving creams is extensive, the following five products are a step above the rest. ​Shaving cream serves three main purposes: to lubricate the skin, to moisturize hair, and to protect the skin from irritation. There are a plethora of shaving products on the market, but using a shaving cream that is trusted could eliminate a majority of the conflicts that an individual may have when shaving. 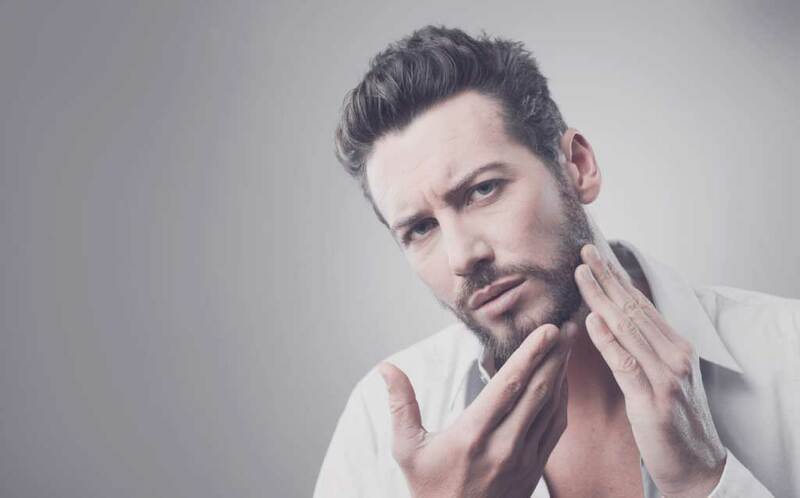 Razor burn, cuts, dry skin, and irritation are all common problems related to shaving, but a good shaving cream will likely eliminate these problems. Most reputable shaving creams contain high concentrations of natural oils that work to lubricate the skin. Proper lubrication ensures that the razor will glide smoothly across the skin while decreasing the risk of nicks and cuts. Moreover, a good shaving cream often contains a substantial amount of glycerine from the natural oils. Glycerine helps to lock in moisture and keep the skin from drying out. Often times, a shaving cream that contains high glycerine levels will seamlessly protect the skin; therefore, it is important to be aware of the quality of a shaving product before purchasing it. ​Deciding on the proper shaving cream is dependent on multiple factors. 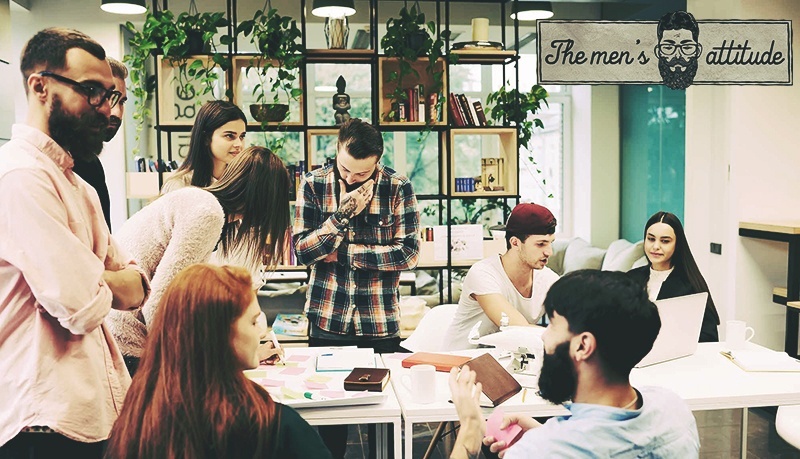 When electing to purchase, it is important to take into consideration the ingredients, the scent, and any guarantees that the product may offer. Before buying a shaving cream, the consumer should have a general idea of what they are trying to protect against. For example, a person who frequently develops razor burn after shaving should strongly consider buying a shaving cream that is recommended for sensitive skin. Similarly, shaving creams come in a variety of scents, and some are even unscented. The physical characteristics of a shaving cream should be considered last, however, as they are completely based on personal preference. While deciding on a shaving cream, an individual may also be interested in the composition of the cream. All shaving products have an extensive list of ingredients, and taking a look at some of them will give the user a basic idea of how the product will perform. Nonetheless, buying shaving cream is all a matter of personal preference. ​Before shaving cream rose to popularity in the mid-twentieth century, it was common for a person to use regular soap and water to shave. Today, it is essentially a no-brainer to use shaving cream instead of the latter because of its emolliating properties. Shaving soap has a much thicker consistency which increases the chance of hair getting caught between the razor blades. Another benefit of shaving cream is the miniscule amount of time it takes to work up a lather. Soap, on the other hand, requires a person to work with the bar until there is proper lubrication. Although soap will get the job done, an individual should strongly consider using shaving cream if time and effectiveness are applicable factors. ​Shaving cream is primarily composed of water, stearic acid, glycerin, fragrance, and sodium hydroxide. The risk of having an allergic reaction to a shaving cream is quite low; however, it is important to scan a product’s list of ingredients before making a purchase. Many shaving creams contain varying concentrations of alcohol which is known to irritate the skin. Luckily, there are a plethora of alcohol-free shaving creams that perform just as well. Similar to alcohol content, infused fragrances can result in moderate irritation. If a shaving cream is causing signs of an allergic reaction, it is important to try and identify which ingredients are causing the reaction. Once the ingredient is identified, a new product without that ingredient should be considered. 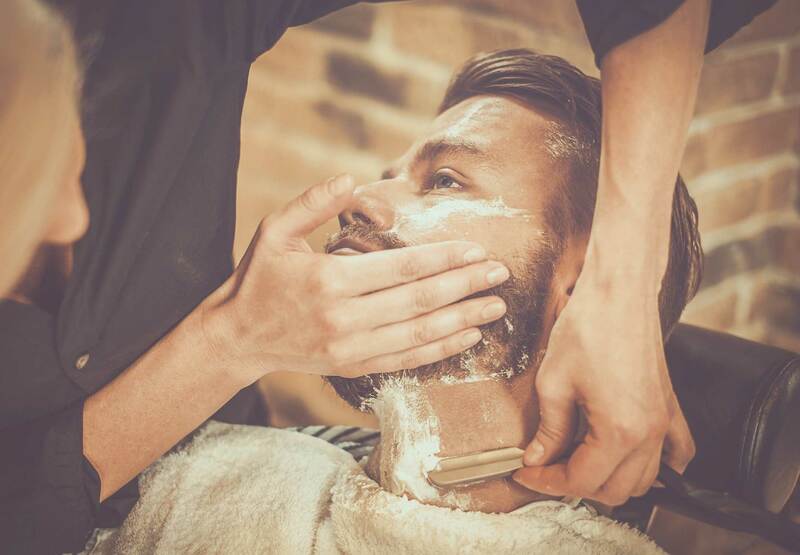 ​Applying shaving cream in a proper manner is essential for getting the closest shave. Before applying the cream, the individual should thoroughly wet their face with warm water to open pores and further expose hair follicles. After prepping the face, the shaving cream can be worked into a lather by using hands, a brush, or whatever method is desired. The cream should be applied liberally wherever there is hair; the goal is to create a layer that is thick enough to protect the face against razor burn and other potential conflicts. Once applied, the individual should act quickly to start shaving because shaving cream has a tendency to dry on the skin over a short period of time. ​What is the Best Shaving Cream? ​​This cream hydrates the skin preparing it for easy smooth shaving. It can be used with a brush to lift the beard and help you shave clean leaving no hairs behind. For stubborn hair, you can shave along against the grind. After shaving, it leaves your face moisturized and healthy. It has a great manly scent due to its rich blend of scented sandalwood, cedar, rosemary, and lavender. The manufacturer also has a fine set of pre-shave oil and aftershave balms that work well with the cream to give you the perfect look. These can be bought together for the extra protection and efficacy. This cream comes with an addition in its package. It comes with a cream bowl to make lathering very easy. Using it with a shaving brush gives you the best results. ​​It is highly concentrated thus little is used for every shave saving you money. ​​​Leaves your skin clean and moisturized. 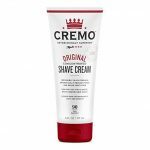 ​The Cremo shaving cream contains moisturizers and oils to soften your hairs and ready your skin for the razor. The cream is very concentrated meaning you need very little for every shave. It contains slick molecules that allow the razor to glide easily on the skin without causing any irritation. This reduces the probability of developing nicks, burns, and cuts on your skin. The cream is made of natural ingredients like aloe, macadamia seed oil, olive leaf extract, calendula, lemon, and papaya extracts. In addition to protecting your skin, this bouquet blend also leaves you smelling good. The natural oils used also make it good for use on various skin types. 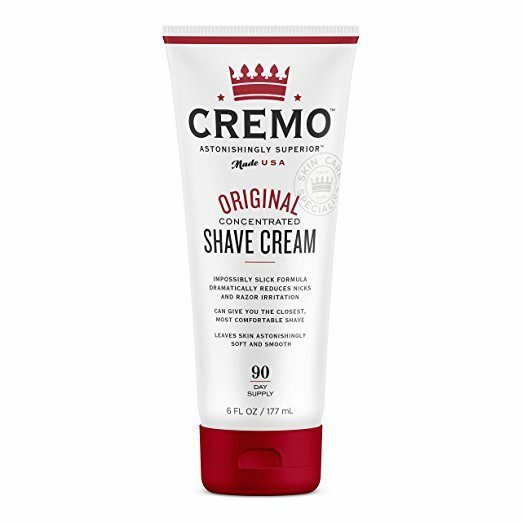 The Cremo shaving cream comes in three varieties; original, cooling, and sandalwood, to give you that effortless shaving experience. The original formulation is packed with oils to protect your skin. The cooling cream contains menthol that leaves your skin feeling cool after every shave. The sandalwood has a thick manly sandalwood scent that leaves you smelling wonderful. ​It is quite expensive but gives you value for money. Since little is used, the bottle lasts longer. ​This shaving cream has an ultra lubricating formulation to prepare your skin for smooth shaving and leave you moisturized. It contains six natural oils for maximum skin benefit. The natural oils include grapefruit extracts, lime, and bergamot. With millions of micro-silicon beads, it gets slicker as you add water giving a clean smooth shave. It is foamless when mixed with water to create a protective barrier on your skin to prevent nicks, burns, and take care of ingrown hairs. It can be used for everyday shaving either in-shower or post-shower. The cream rinses out very easily and does not clog your razor. Keen shaving is required to achieve the best results. The Billy Jealous cream is dermatologically tested and it won the Best Shaving Cream Esquire 2007 grooming awards meaning it is one of the most efficient on the market currently. 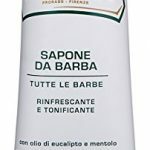 ​This amazing cream is made in Italy and can be used for any type of beard or skin. The cream is enriched with natural ingredients like eucalyptus oil that purifies your skin and menthol that cools and revitalizes. It softens your skin and hair for a quick shave and is enriched with moisturizers to keep your skin hydrated after every shave. It also lathers easily and is formulated with glycerin to ensure smooth gliding of the blade on your skin. The cream is purely natural with no silicone, no parabens, no mineral oils, and no artificial colors reducing its effects on your skin. Using the cream with pre-shave oils and post-shave balms guarantees a flawless look and great skin. The cream is mostly ideal for normal and oily skin. ​This premium shaving cream lifts and softens the beard for a comfortable shaving experience while protecting the skin from razor burns and irritation. It can be lathered with your fingers or a shaving brush. It is rich in essential oils and glycerin leaving your skin feeling smooth and hydrated hence making it suitable for use with different skin types. The cream is aromatherapy based since it is scented with natural oils. To shave, use warm water and shave with the grain to avoid irritation. For a closer shave, shave against the grain lightly. Choosing the proper shaving cream is perhaps more difficult than it seems. ​Taylor of Bond, ​Cremo, ​Billy Jeallousy, ​Propaso, and ​The art of Shaving all make great products, it is clear that one of them is considered the best choice. 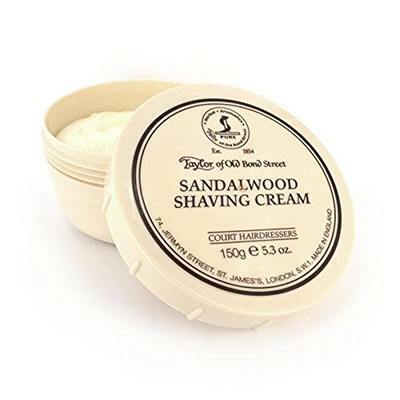 ​The Art of Shaving Sandalwood Shaving Cream is the clear winner of this discussion. The ​essential oils and glycerin is a bonus for anyone that uses this product because it keeps the skin looking healthy. 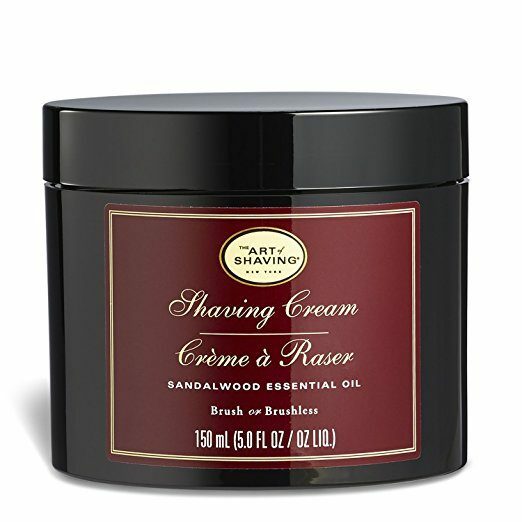 ​​The Art of Shaving Sandalwood Shaving Cream​ is also alcohol-free and dye-free which makes it a great choice for individuals who are concerned with allergies. 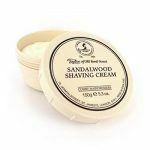 After analyzing all of the factors, it is clear that ​The Art of Shaving Sandalwood Shaving Cream is the best shaving cream from the aforementioned.